Lucy Walker’s moving documentary about the massive Jardim Gramacho dump in Brazil and the people who make their living picking through it, opens Friday in New York, Nov. 5 in L.A. 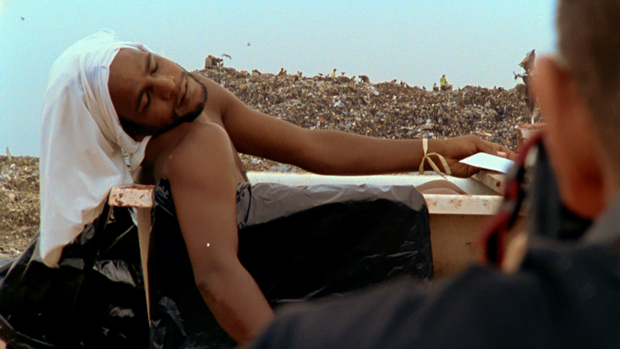 Waste Land, a new documentary about an art world superstar and garbage pickers in one of the largest dumps in the world, will change the way you think about chucking trash. In Brazil, it goes to places like Jardim Gramacho, a 321-acre dump on the outskirts of Rio de Janeiro that handles 70% of the metro’s trash. But rather than preach inconvenient truths about recycling with an oozing, stinking, open-air landfill as a main character, Waste Land focuses on the dump’s catadores–garbage pickers–who sift through some 7,000 tons of fresh waste daily to eke out their living. An estimated 3,000 to 5,000 of them live on the dump site; 15,000 people make a living on activities related to it. Waste Land focuses on a few unforgettable characters. They find glass, plastic, and metal which is bundled and sold in bulk to recyclers. They find treasures–books, cash, borderline meat which at least one dump chef, “Irma,” cooks up in found pots for hungry catadores. They find bodies, too, victims of drug and favela wars who’ve been “necklaced” (a gruesome execution in which a tire is placed around a victim’s neck and set ablaze). They find dead babies. Nevertheless, it’s an uplifting story. 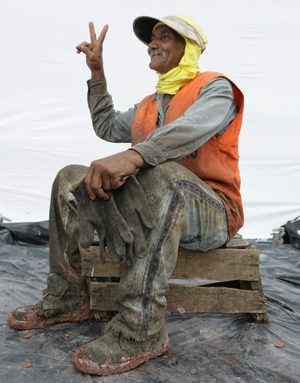 The catadores work under a minimal code of safety. They have a co-op run by an idealistic young man named Tiaõ (below). Most of all, they have pride in the idea that they provide a vital service. These are not your average street corner can collectors. They help extend the life of the landfill and reclaim precious materials for re-use. In short, they are saving the planet in the most hands-on way imaginable. “They’re incredibly environmentally responsible,” Walker says. As several of the pickers point out, it’s not prostitution or drug-running, two other popular paths for Brazil’s poorest. In the film’s only real lecture-like scene, an aging picker named Valter (right) is asked whether individuals pulling pieces out of tons of garbage can really make a difference. His answer: yes, of course. “Ninety-nine is not 100,” he says. 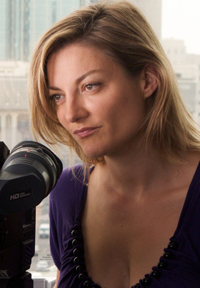 Valter, along with each of the other main characters impacted Walker (Blindsight, Countdown to Zero) in unexpected ways, she says. She showed up in 2007, dressed in layers and overalls. The women pickers wore bright contrasting clothing, accessories, giant earrings. “There’s actually a Gramacho look,” Walker says. There’s a twist in Waste Land. 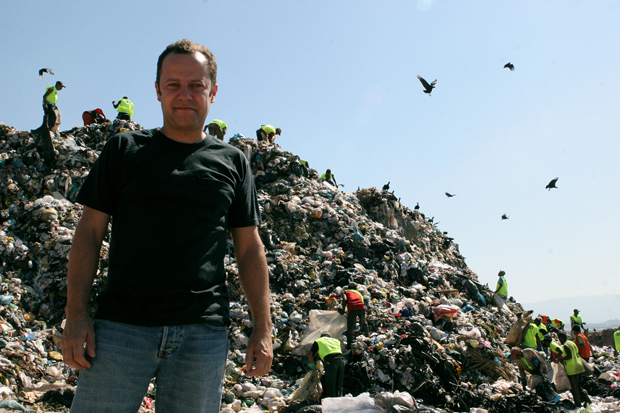 It’s not spoiling any surprises to say that viewers are ushered into the dump by a seemingly unlikely host, part-time Brooklyn-based artist Vik Muniz (top). He’s found enormous fame and wealth with arresting images and what is, essentially, a gimmick — re-doing famous pictures with weird materials. He’s recreated a double Mona Lisa in peanut butter and jelly, aped a famous shot of Jackson Pollock using Bosco syrup, and recast a Civil War portrait using toy soldiers. His prints sell for tens of thousands of dollars at auction. “He’s practically printing money as an art photographer,” Walker says, adding that she’s Muniz’s biggest fan. But Muniz hasn’t come to exploit the trash workers. He was raised poor in Brazil himself. He won an art scholarship, landed a gig with a billboard company where he rose to prominence, then got shot in the leg on the way to a black-tie gala. His attacker paid him not to press charges, and Muniz used the money to come to America. 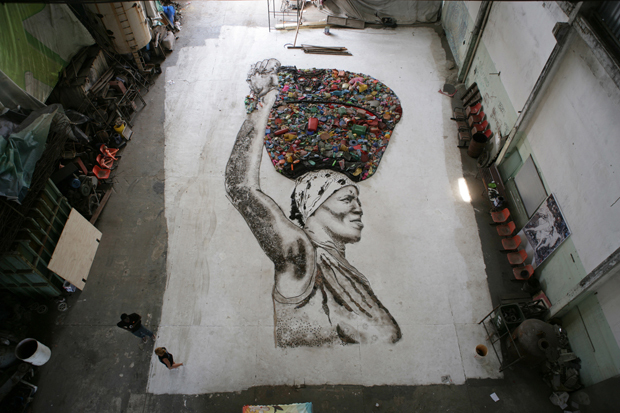 In the film, he decides to return and take portraits of the catadores, then recast those photos in massive sizes using recyclable materials (don’t call it “trash”) from Jardim Gramacho. He enlists the catadores (still considered an underclass) in a paid social experiment–one that becomes a wedge between Muniz and his wife. “What I really want to do is to change the lives of a group of people with the same materials they deal with every day,” he says in the film. We see how the pickers handle this radical makeover of their lives, from trash denizens to artists. Over a musical score by Moby (a longtime friend of Walker’s) scenes from art galleries are juxtaposed with hellish scenes from Jardim Gramacho. One second, someone’s sipping champagne. The next, someone else is slogging through a mountain of filth on a rainy day, dodging a gush of garbage juice as a front end loader pours out a fresh batch. 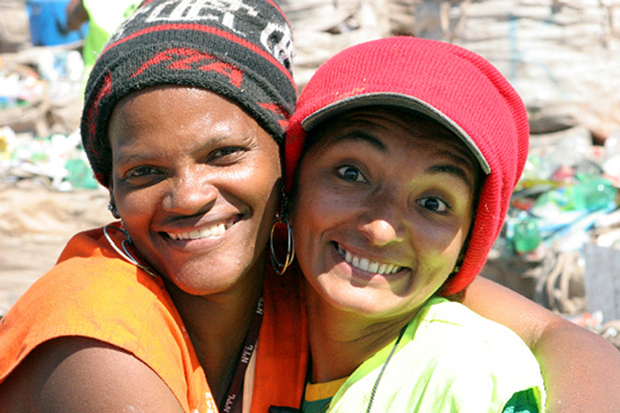 At one point, a striking, angel-faced young picker named Isis (below, with another worker, Valeria–Isis is on the right), who’s suffered a string of tragedies, declares, “I don’t see myself as trash anymore.” Tearing up, she adds, “I don’t want to go back to the garbage.” Some do, though. The question left intentionally unanswered is what becomes of the catadores in the decades after Muniz’s project. Will the ones who went to work at the dump after falling on hard times use this leg up to get out? Will career pickers keep picking? And in the end, will they find themselves plucked from all that trash and remade into something new or end up feeling used and discarded? “It’s a film about recycling people, too,” Walker says. Walker gave us a few updates on prominent catadores whose situations have changed since the last cut of the film. In addition to money for various needs, each of the film’s main characters got a house. The rest of the money from the sale of art in which they were depicted went to a catadore association dedicated to improving the group’s overall situation. Tiaö continues to run the association and show up for occasional events around the film, where he always brings down the house. Follow Tyler Gray on Twitter.